When your wedding anniversary is approaching, that means that you have to have a sit-down and think about what you’d like to get your spouse this time around. Is it going to be a gift that suits their personality to a T? Perhaps something the both of you can share together? Or maybe you just want to indulge them. Choose a pampering present for your spouse to make sure that they know you appreciate them and want to take care of them always. What better way to pamper your partner than to treat them to a spa weekend away? There are plenty of spa getaways in Australia, such as in Daylesford or the Hunter Valley, as well as abroad from New Zealand to the Alps. An Australian spa getaway might be a little more doable, but if it’s a big anniversary then it’s well worth doing a big spa trip abroad – and combining it with some other holiday activities and destinations. Your partner will absolutely love you for it! Or a spa weekend at home? Not everyone can afford the spa weekend away. IF you’re running a little low on funds, then the spa weekend at home is your second best bet. We have oodles of pampering hampers available that can help to set the scene for your pampering weekend at home. These include the relaxation and tea pack, a sure fire winner for those who enjoy tea, and the serenity hamper which helps to soothe frazzled nerves and really relax. Don’t forget to add a bottle of bubbles for a truly relaxing and indulgent treat for your partner! If you’re after something a little less “bath time pampering” and a little more “me time pampering” for your partner, then there is no going past one of our chocolates and red wine gift baskets. These baskets come filled with an array of different treats, but of course, all of them will come with at least a few chocolate and a bottle of red. Choose from one of our more basic baskets, or go all out and treat your partner (and hey, probably yourself, too) with one of our more grand baskets, filled to the brim with delicious extras and chock-full of extra chocolate treats to boot. Have a look through our hampers to see if there is a pampering present to treat our partner this wedding anniversary. With every purchase of our charity hampers, no less than 10% goes to the charity of your choice. This is also a great way to give back to the charity that your partner loves the most! At Christmas time, everyone is looking for the perfect gift for their family and friends, but, at times, it can be hard to know what gift to give. Why not give twice with a charity gift hamper? Christmas hampers are the perfect gift for those hard to buy for friends or the family member who already has everything. Hampers come in a range of sizes and are perfect for a single person to a whole family. Hampers are delivered, you don’t have to worry about crowded shops, wrapping and posting your gift, it’s all done for you. You can buy a hamper that suits your recipient, from the lover of sweets, to the lover of a fine wine. Hampers are known for quality products and luxury treats; your gift will never be seen as *cheap* or thoughtless. Because gift baskets come in a range of styles and sizes, they are affordable. Classic Christmas Hamper – beautifully presented inside a Charity Hampers Signature gift box is – a bottle of Two Churches Cabernet Sauvignon 2014 from the Barossa Valley, Chocolatier Christmas Baubles, Puddings on the Ritz Christmas Pudding, Falwasser Rosemary and Sea Salt Crisp Bread and from Ogilvie and Co Fine Foods – Antipasto Olives, Honey Roasted Peanuts and Butter Shortbread. Gourmet Christmas Hamper – perfect treat for your favourite couple – packed stylishly with ribbon, tissue and a gift card, inside – Penfolds Bin 138 Shiraz Grenache Mataro from the Barossa Valley, Rinaldi Artisan Crafted Soft Honey Nougat with Macadamias, Chocolatier the Collection Assorted Chocolates and Jellies, Carlie’s Traditional Raspberry and White Chocolate Mini Melting Moments, Puddings on the Ritz Christmas Pudding, For the love of Cheeses Artisan Fruit and Seed Crispbread, and from Ogilvie and Co Fine Foods – Antipasto Olives, Honey Roasted Peanuts and Butter Shortbread. Jolly Christmas Hamper – is perfect for the family, it’s jam packed with treats everyone will love. Starting with a range of treats from Ogilvie and Co Fine Foods – Rum and Brandy cake, Caramel Fudge Desert Sauce Gift Pack, Butter Shortbread, Antipasto Olives, Honey Roasted Peanuts. For the love of Cheeses Artisan Fruit and Seed Crispbread, Baylies Dark Belgian Chocolate Rum and Roasted Almond Rum Balls, Puddings on the Ritz Christmas Pudding, Lolly Shop Raspberry Cream Bullseyes Boiled Lollies, Chocolatier the Collection Assorted Chocolates and Jellies, Carlie’s Traditional Raspberry and White Chocolate Mini Melting Moments, Artisan Gingerbread Man, Falwasser Rosemary and Sea Salt Crispbread, and Rinaldi Artisan Crafted Soft Honey Nougat with Macadamias, all stylishly presented in a Charity Hampers signature Christmas Gift Box, complete with tissue, ribbon and a card. Charity Hampers has been around since 2009, and they’ve been supporting almost more than 70 Australian charities. 10% of the purchase price of any hamper will be donated to a charity of your choice. So why not give back by spoiling your husband on your wedding anniversary with one of these fantastic hampers. It’s a complete win-win situation. If your husband is the ultimate grill master, Beer & BBQ hamper is for him. It has everything he needs for a Saturday afternoon barbeque, all you have to do is buy the meat. For the man who loves chocolate. Cookie and Chocolates Galore hamper does precisely what it says, there’s so much chocolate involved, that at first glance you won’t be able to take it all in. If your man enjoys spending time in the kitchen, then Food & Beer gift hamper is for him. Food & Beer by Ross Dobson is the star of this anniversary present idea. It has more than 80 delicious international recipes. These recipes can be enjoyed with the rest of the hamper. Whatever you choose to get your husband for your wedding anniversary, Charity Hampers is the place to look. And it will go to a good cause – on all fronts! Christmas holidays are a time to give, and now you can give twice with Charity Hampers. If you’re shopping for the lady in your life, you can buy her a gift with a difference. When you buy a gift basket from Charity Hampers, 10% of the purchase price is donated to a charity of your choice. Your recipient will get a thank-you card that she can treasure all year. You probably know her fairly well, so you know the kind of cause that would warm her heart. So before you select her gift, go to our charities page and browse the available options. Our donations cover kids, animals, cancer, disabilities, mental health, and much more. As for the gift itself, it will depend on her personal preferences. If your lady enjoys a good glass of vino, you can pick a gift basket containing her favourite kind of drink. We have dedicated Merry & Bright hampers with either Champagne, Italian Prosecco, Sauvignon Blanc, or Shiraz. Each bottle is bundled with Christmas pudding and a gingerbread cookie. If you’d like your Christmas sentiment to be a little cheesy, you could buy her a Moet Christmas hamper. It contains a selection of cheese including pepper cheddar, complete with a fancy French cheese knife and a customised cheeseboard. Of course, it’s not all cheese. The hamper also contains honey, nuts, dried muscatels, beer paste, and bread. For that special Christmas feeling, the gift basket is topped off with a Fig & Walnut log. Throw in a cheesy haiku scribbled onto the gift card and she’ll remember this Christmas forever. For extra points, compose the poem yourself. For the girl with a sweet tooth, offer her some Cookie and Chocolate Delights. It’s a tongue-tingling assortment of milk chocolate cookies, hand-made fudge, Australian dark chocolate, and more tasty morsels of pure indulgence. There’s so much sweetness in there she could celebrate herself with a treat a day for the entire Christmas season. Of course, her Christmas present doesn’t necessarily have to be Christmassy. You could pamper her with something delicate and pretty in pink. The Sweet Treats Pamper Box is packed with customised Caramella products from Urban Rituelle. The box has caramel flavoured lip balm, hand lotion, parfum, and a scented soy candle. Each item is branded in pretty pink packaging, including a pink cosmetics bag that will always have her thinking of you. After this Christmas, caramel will never smell the same again. Christmas isn’t just about stuffing stockings and unwrapping them under the Christmas tree. It’s also about spending quality time together. Carve out some alone time for you and your special lady. It could be lunch with mum, a shopping trip with your sister, a movie with your favourite female friend, a starlit walk with your girlfriend, or a home-made dinner with your wife – as long as you promise to do the cooking and the dishes. To buy your mother, sister, wife, or girlfriend a genuinely memorable Christmas present, call Charity Hampers today on 1300 699 126. Every Christmas lots of people decide to send Corporate gift boxes; it’s an excellent option for the busy executive who doesn’t have time to go shopping personally, or, who doesn’t have time to wrap and organise individual gifts. Corporate gift hampers allow you to send a range of smaller gifts to an office or business and the receiver can choose to keep the whole gift or to share the basket with co-workers or staff. When sending a gift hamper to a business, it’s a good idea to send a smaller separate gift to the person you deal with the most. It’s a nice way of showing you appreciate what they do for you and you have acknowledged them and the help or assistance they provide. A corporate gift hamper is a great way to send gifts to many people all at the same time, it can be shared. At Charity Hampers we have a range of corporate gifts – here are some of our favourites. Don’t forget 10% of the value of the hampers you choose is donated to a charity of your choice. A small hamper with some sweet treats – Fudge by Rich Chocolate and Walnut, Byron Bay Cookie Company Milk Chocolate Chunk Cookies in a premium gift tin, Zokoko Goddess Dark Chocolate and Charlie’s Traditional Choc Salted Caramel Mini Melting Moments, all presented in our Charity Hampers Chocolate Box Hamper. Something for everyone – presented in our Charity Hampers Boxed Treats – Fudge by Rich Chocolate and Walnut, Charlie’s Traditional Lemon Mini Melting Moments, Rinaldi Artisan Crafted soft Honey Nougat with Macadamias, Maggie Beer Quince Paste, Baylies Charity crackers with sesame seeds, Ogilvie Mixed olives and roasted peppers antipasto and caramel onion and balsamic relish, and some Port Willunga Salted Pistachios. Filled with sweet and savoury treats, perfect for enjoying over the Christmas holidays. Two Churches Cabernet Sauvignon from the Barossa Valley, Ogilvie and Co Fine foods butter shortbread, Baylies Charity crackers with mountain leaf pepper, Ogilvie and Co Fine Foods antipasto olives and honey roasted peanuts, Chocolatier Pure Indulgence Dark Chocolate Truffle Assortment, Falwasser rosemary and sea salt crispbread and Charlie’s Traditional Raspberry and White Chocolate mini melting moments, all stylishly presented in a Charity Hampers Festive Christmas Hamper, finished with festive ribbon, tissue and a gift card. If you want to impress, but are working on a budget, this hamper has you covered – Ogilvie and Co Fine foods butter shortbread, Charlie’s Traditional Raspberry and White Chocolate mini melting moments, Lolly Shop Raspberry Cream Bullseyes boiled lollies, Rinaldi Artisan Crafted soft honey nougat with Macadamias, Ogilvie and Co Fine Foods antipasto olives and honey roasted peanuts, and Falwasser rosemary and sea salt crispbread, all presented in our signature gift box. Christmas is coming, and it’s the time of year that gift giving can be a nightmare. People don’t know what to buy the woman in their life – be it their mum, sister, wife, aunt, grandmother, so we all stick to the *safe* gifts pyjamas and perfume. Why a Christmas gift hamper? Gift hampers are both fashionable and convenient. They take all the guesswork out of trying to find a gift and spending endless hours wandering around the shops. Gift hampers aren’t boring, and you’ll find a wide range available with everything from alcohol to candles. Gift hampers are a gift that is much appreciated, it’s a thoughtful gift, and it’s giving lots of little gifts in one basket. Even if there is something in there she doesn’t like, wants or needs, there are bound to be other items she adores. Gift hampers are great gifts for particular loved ones! When you send a Charity Hampers gift for Christmas this year – 10% of the value of your chosen Christmas gift hamper is donated to the charity of your choice, help us to help others and send a gift knowing you are also helping those in need. For the woman who loves to treat her skin and senses, with a delightful buttery caramel fragrance Sweet Treats Pamper Box is packed full of relaxing treats from Urban Rituelle – Caramella scented Soy candle, organic lip balm, petite parfum, petite hand cream and a premium cosmetic bag all presented in a Charity Hampers signature gift box. Fine chocolates and some pampering products – what more could she wish for. Stylishly presented in a signature Inspired Hamper gift box are some wonderful Urban Rituelle products – Hyacinth and Mimosa Fragrance diffuser and scented soap bar, along with a kitchen apron and box of Chocolatier Deliciously Indulgent milk and dark chocolates. She will love you this Christmas! Beautiful Urban Rituelle products that capture the soft and sophisticated scents of lotus blossom, musk and a sprinkle of sweetened coconut. Presented in our signature Coconut and Lotus pamper gift box – Urban Rituelle Coconut and lotus hand cream, hand and body wash and scented soy candle. Is there anything more relaxing and indulgent than slipping into a fluffy bathrobe, drinking a glass of Moet and Chandon champagne and enjoying chocolates. If you think your lady will appreciate this – then spoil her this Christmas. Beautifully presented in our signature Moet Pamper Treat gift box, finished with ribbon, tissue and a gift card, inside she’ll find a gorgeous luxury bathrobe with a super soft pile that lasts, a bottle of Moet and Chandon Imperial Brut Champagne and a box of Chocolatier Deliciously Indulgent milk and dark chocolates. Everything you do in a corporate setting makes a statement. Whether it’s the shape of your logo, the colour of your branding, or the way you handle customers, it says something important about your business. While your mission, vision, and organisational strategy are probably more focused on the big things, the little things matter too. What exactly are these little things? One factor is how you treat your employees. From a corporate perspective, it’s probably enough to pay their wages on time. But on a personal level, the treatment employees receive at work has a significant impact on their performance. And the better they perform, the bigger your bottom line will be. Keep your team happy with thoughtful things like benefits, flexitime, help with childcare, and gift hampers. These can become a business tradition. Maybe they can receive hampers on birthdays or other special occasions. And hampers aren’t just for your team members. Key clients can get gift baskets too, as a thank you for their continued business. In line with maintaining a positive company image, why not combine corporate gifts with charity work? When you order a gift basket from Charity Hampers, 10% of your pre-delivery price is donated to a charity of your choice. We support more than 60 charities that cover cancer research, animal protection, environmental conservation, and much more. When it comes to the hampers themselves, we have more than 20 on offer, and you can spend between $50 and $500 depending on your budget and specifications. We offer a delivery service for both bulk and individual hampers, and discounts are available for multiple batches of gifts. If you’re unhappy, we guarantee your money back. Our hampers cover a wide variety of tastes and preferences. We have alcohol, chocolate, cheese, luxury items, and pamper hampers. If your recipient is a beer drinker, give them an international beer taste tour all in one basket. Our beer hamper includes Heineken, Peroni, Stella Artois, Corona, and Becks, plus a selection of potato chips and nuts. We cater for wine drinkers too. You could go for a chocolate hamper paired with either red or white wine, or try a duo hamper that includes a bottle of both plus some honey, nuts, and fudge. For those who prefer their snacks salty, we have a Shiraz and Savoury hamper with crackers, nuts and relish. It also includes tasting notes. Whisky lovers aren’t left behind. Our Glenfiddich hamper contains a 12-year-old bottle of scotch and some decadent chocolate to go with it. And if you can’t decide what to put in and what to leave out, pick our Luxury or Executive hampers. They have a bit of everything. Not a drinker? We have coffee gift baskets which include an easy-to-follow book that teaches you how to create designs atop your cup of espresso. The hamper also has a coffee blend, fudge, and melting moments to go with your favourite mug of brew. As you order your hamper, you’ll be prompted to select your charity. We’ll let them know about your donation, and stamp your hamper with a foil thank-you sticker confirming your choice. To pick a gift basket and make a difference today, give us a call on 1300 699 126. We all want to get something a little extra, whether it’s a bonus gift or a savings coupon. Well, what if you could get your dad an amazing birthday gift and donate to charity all at the same time? To make it even better, dad’s gift will have a special thank-you stamp so that he gets the warm fuzzies of knowing he helped someone else. That’s exactly what you get when you order any gift basket from Charity Hampers. We donate 10% of your cost to a charity of your choice – or your dad’s choice. And we have a couple of tailor-made gift hampers for him. Our Dad oriented hampers are so varied that you can find one to suit your dad easily and you can put your dad’s name on a $10 donation to his favourite charity. You can choose from any of our 60+ charities. They cover leukaemia research, pet protection, teen outreach, and so much more. We even have clown doctors, so browse our donations page and take your pick. As for the hampers themselves, we cater to both the drinking dad and the teetotaller. If dad enjoys his claret, the Red Wine and Nibbles Hamper is bound to hit the right spot. It contains a bottle of Two Churches Cabernet Sauvignon. It also has a variety of snacks he can enjoy as he sips his glass of 2014. The gift basket includes crisp bread, wasabi peanuts, melting moments, chilli almonds, crackers, relish, olives, and roasted peppers. There’s quite a bit of kick in this gift, so you might want to have a glass of milk on hand to cool down your dad’s tongue. If dad is more of a coffee guy, get him the espresso lover’s delight. It has a book with top barista tips and tricks. In a few weeks, he’ll be an expert on coffee art and can dazzle his guests with fancy coffee mug designs. The gift basket also contains melting moments, rich, luscious fudge, and Woolloomooloo coffee blend. When you’re ordering your gift hamper, you’ll be prompted to choose which charity you want your donation to go to. If you’d like the hamper to be a surprise for your dad, quiz him on the causes he believes in, so that you can choose one without asking him directly. As part of his gift package, your dad’s hamper will have a foil sticker naming his chosen charity. The charity itself will receive an email listing his name and donation. The hamper will then be delivered to your dad. Check our delivery guide so that he gets his birthday gift hamper on time. And don’t hesitate to glance at the money-back guarantee. To make a difference in the world and bring a smile to your dad’s face, call us on 1300 699 126 and order your Dad’s hamper today. When it comes to buying gifts for your boss, it’s always tricky as you don’t want to give them a gift that is puzzling or offensive. You want to give your boss a gift that is appropriate and one they will appreciate (one that’s doesn’t put you in their *bad books*). It can sometimes be quite stressful finding the perfect gift, but it doesn’t have to be. If you are concerned about how much money to spend – you don’t want to spend too much and put yourself off-side with your co-workers, but you don’t want to give a gift that looks cheap and nasty. Why not consider pooling your resources with all or some of your co-workers and buy your boss a lovely gift hamper? Gift hampers are a great gift for your boss – a gourmet or pamper gift set are also great gift ideas. It all depends on your industry and your boss as to how much or how little you spend on him (or her) and what type of person they are. Here are some great gift ideas for the boss, that can be delivered right to his or her office. Red wine in a wooden case – a perfect way to show your appreciation, this gift is presented in a wooden gift box, finished off with a ribbon and card, inside – D’Arenberg Footbolt Shiraz 2013 McLaren Vale and a Chocolatier deliciously indulgent milk and dark chocolate assortment chocolate box. Coffee Lover – perfect for the boss who loves their coffee. Barista is an Italian word meaning someone who has mastered the espresso machine and is also an expert on brewing and mixing espresso beverages. Included in this hamper is the Barista Coffee Collector’s Edition book that not only guides you step by step through designing some wonderful cappuccino art, it also includes cake and biscuit recipes using coffee as an ingredient! Also included in the signature gift box is Toby Estate coffee – Woolloomooloo Blend, Fudge by Rich Chocolate and Walnut, and Charlie’s Traditional Choc Salted Caramel Mini melting moments. Gourmet Delights – this gift hamper contains treats that can be enjoyed straight away along with some pantry essentials that can be enjoyed throughout the year and contains a little bit of everything…. Maggie Beer Extra Virgin Olive Oil, Verjuice, Aged Red Wine Vinegar, James Road Chocolate Fudge Biscuits, Simon Johnson Wasabi Peanuts, Fudge by Rich Chocolate and Walnut, and Charlie’s Traditional Raspberry and White Chocolate Mini Melting Moments, Chocolatier Pure Indulgence Dark Chocolate Assortment, Bizzari Dolci Handmade Lavosh, Port Willunga Feijoa Paste and Falwasser All Natural Crispbread, all presented in a Charity Hampers signature gift box. Don’t forget 10% of what you spend will be donated to charity – another thing your boss is sure to appreciate. Relaxation focused Charity Hampers are the perfect gifts to give for birthdays, anniversaries, Christmas, to say thank you, or to make people feel special. The even better news is 10% of the money you spend goes to charity! A gift basket is a perfect way to give a bunch of smaller gifts in one unique package, and a gift hamper of *relaxing* items is perfect for that busy mum or stressed out businessman. Gift hampers allow the recipient to see everything that is in the box, which is often wrapped or lined with coloured cellophane or tissue. Sweet Treats Pamper Box is the ultimate gift for treating the body, featuring some delicious and beautifully scented pampering treats including – Urban Rituelle Caramella products – scented soy candle, petite parfum, Petite hand cream, organic lip balm and a premium cosmetic bag to store them in. All stylishly presented in our signature gift box finished with tissue, ribbon and a card. Pamper Him Deluxe gift hamper completes with a luxurious bathrobe, chocolates and some *manly* Urban Rituelle grooming products – all in one wash, shaving cream, aftershave balm, Microplush bathrobe (one size fits all) Chocolatier deliciously indulgent milk and dark chocolate assortment. Perfect for Valentine’s day, birthday’s, Father’s Day or wedding anniversaries, presented in a Charity Hampers signature gift box with ribbon, tissue and a card. Men’s Pamper Box gift hamper – look after your dad, husband or boyfriend and treat him to some lovely Urban Rituelle men’s grooming products. He’ll love this stylishly presented signature gift box containing All in one wash, Shave cream and aftershave balm, wrapped in tissue and ribbon, complete with a card. Moet Pamper Treat gift hamper – we saved the best to last! The ultimate luxury pamper gift hamper – can you think of anything more indulgent than sipping champagne in a soft fluffy bathrobe while enjoying some chocolates? 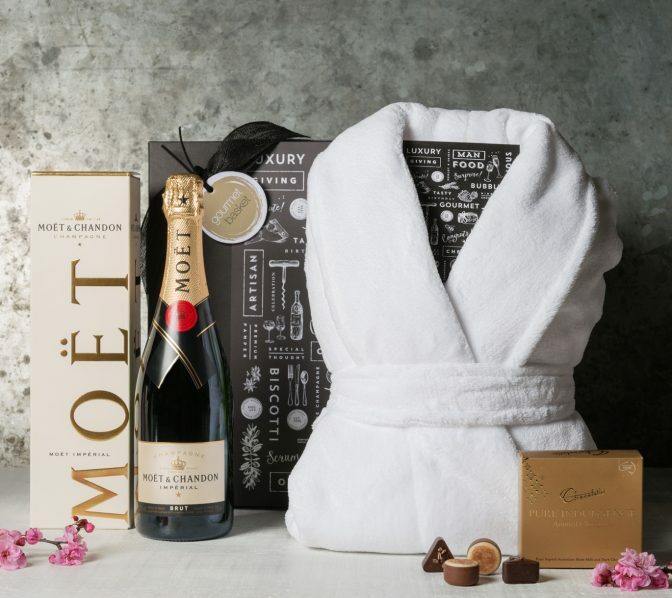 This stunning gift hamper contains – Moet & Chandon Imperial Brut Champagne – France, Chocolatier deliciously indulgent milk and dark chocolate assortment and a luxurious bathrobe with a super soft plush pile fluffiness that lasts. Stylishly presented in a Charity Hampers signature gift box finished with ribbon, tissue and a card.